The consumer is all powerful. The way we choose to spend our money can change everything. No company will continue a practice or a product that you the consumer will not buy. If you don't buy their stuff, they go out of business. We define a candidate by how much money they can raise, not by their ideas or their record in public service. We really don't have an election any more - we have an auction. Every president rewards big donors with appointments such as on the Federal Advisory Panel that might influence the approval of new drugs or environmental regulations. Having so much money in politics gives all the power to those with money. The media in the hands of big business will only present us with the politicians that will serve their interests. It would be unreasonable to expect politicians to change the system that put them in power. Anyone who comes out as a democratic idea is dismissed as an extremist. Corporations are monsters trying to devour as much profit as possible, at everyone's expense. "Some of the biggest men in the US are afraid of something. They know there is a power somewhere." Whenever the government needs money, it requests it from the Federal Reserve. But the Fed doesn't just give the money to the government, it loans the money at interest. This keeps the government and the people in a continuous state of debt. All of our income taxes are paid to the Federal Reserve to pay off the debt the government incurs when it borrows money from the Federal Reserve bank. One would think the power to control the money supply that controls our economy and affects our lives in every way, would be in the hands of the government, but it is not. It is controlled by the Federal Reserve Bank, which is not a government organization. It is a private banking cartel. It is a group of large and powerful, private banking interests. The government has given it a monopoly to create the nations money supply. Congress has failed us miserably because many of them are beholden to the military industrial complex. The Pentagon shapes the news. "Together we can accomplish anything." The way to win back democracy, and end wars, and save our environment, has just one cure. The consumer is all powerful. The way we choose to spend our money can change everything. No company will continue a practice or a product that you the consumer will not buy. If you don't buy their stuff, they go out of business. If there is a single most important thought to take away from Ethos it is that nothing is going to change unless 'you' get involved. Our governments are in the hands of big business. Big business is blind to everything but the bottom line. They are unregulated and they are poisoning our planet. Our democracy is broken, voting isn't going to fix anything. Our media is owned by massive corporations. They only give us information that serves their own interests, it would be illogical for them to do otherwise. So, that just leaves you and me. What can we do? We have to get involved. When we choose to spend our money wisely we can change everything. Everything!! We can deny profits to corporations who act without conscience and support those that do business in a socially responsible way. No company will continue a practice or a product that you do not support when you buy their stuff! It is either change or go out of business. Simple, but very powerful. You can make them change, and change has only ever come from the people. Our future is our responsibility. Watch the video for lots more important information. 8. Cyberwars In 2010, every major government acknowledged that Cyberwar was a clear and present danger and, in fact, had already begun. The demonstrable effects of Cyberwar and its companion, Cybercrime, are already significant and will come of age in 2011. Equally disruptive will be the harsh measures taken by global governments to control free access to the web, identify its users, and literally shut down computers that it considers a threat to national security. 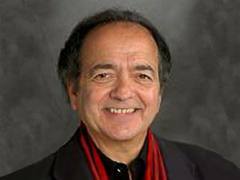 With http://www.trendsresearch.com/forecast.html an unexcelled track record to prove it, no one can provide a more accurate look into the future than Gerald Celente, Trends Journal Publisher. The false gods of usury-based, debt finance revealed: It is a cult of falsehood best referred to as: the Church of Usury Falsehood. The definition of ‘church’ as provided by Wikipedia is as follows: "“A church is an association of people who share a particular belief system.”"
The defenders of the dogma of conventional, usury-based, debt finance claim that interest – which ought to be correctly called usury – is an essential component of modern age economics. This belief system qualifies them to be associated with the Church of Usury Faslehood. In Canada, the word usury is currently being used to define an excessive or exhorbitant rate of interest legally permitted by the Bank Act. It is my understanding that any rate of interest over 60% is currently defined as usury by the Church of Usury Faslehood. Any rate of interest on money above 0% ought to be correctly defined as usury. The usurers of this 21st Century are directed to this quote of wisdom from Aristotle: "“He who takes usury for a loan of money acts unjustly for he sells what does not exist. "” For lack of knowledge the whole of the Western World has been delivered into the hands of the global ‘money changers’ otherwise referred to at the Bilderbergs and their ilk. During the 20th Century, the old Socreds from Canada and elsewhere widely proclaimed that (a) interest or usury on money is theft and (b) that money cannot have babies. Both assumptions are absolutely truthful and correct. The people of the Middle Ages re-instated God’s Law as it pertained to economics. They neither exacted usury nor paid it. Usury was absolutely prohibited. It was the aids of its day – economically speaking. Consequently the lands were full of spiritual and material wealth and the people enjoyed the reality of usuryfree living. It is interesting to note that the Koran, the holy book of Islamic Law prohibits the payment and receipt of interest, usury or riba as it is called. Islamic Law claims to replace Western Banking with a system prescribed by an Islamic Code of Conduct called ‘Sharia.’ The only loan transaction permitted by ‘Sharia’ is one in which lender and borrower share the risk as well as any possible profit; the lender can lose the whole of his loan and the borrower only what he or she has contributed to the enterprise, including labour. However, a cursory review of what’s really going on in ‘Sharia Compliance’ in the western world in this 21st Century, indicates that its creditors are intent on tricking the Prophet Muhammad, whose Islamic Law absolutely forbids usury. Apparently, 21st Century Islamic Law uses its ethical screening process to allow a variety of credit-based transactions wherein the debtors are paying to creditors equivalent amounts of money for loans or mortgages as managed by the typical western banks. If these Islamic creditors of these credit-based transactions were truly dedicated to usuryfree living, then their loans and mortgages would be assessed a simple transaction fee and their debtors would be paying much less than the typical North American debtor who is saddled with monthly usury costs. My assessment is that the Islamic debtors in the Western World are paying similar amounts for their indebtedness as are the typical, western debtors. For example, the banking entity purchases a property, thereby re-structuring the transaction to be defined as a ‘sales transaction.’ Obviously, the burden of the debt still exists with the debtor. It is really interest or usury – otherwise defined. I don'’t think that the Prophet Muhammad would be tricked if he was asked to approve such a tricky transaction. It is my observation that ‘Sharia Compliance’ when honestly and honourably practiced would be wholly incompatible with the sort of wheeler-dealer brigandage that prevails within the Church of Usury Falsehood in the Western World. Where is the uncompromising militancy demonstrated by the Gospel story that resulted in the physical expulsion of the money-changers from the Temple? Such militancy will once again arise when re-educated debtors exercise their total conviction to experience the reality of usuryfree living – hopefully in this incarnation. 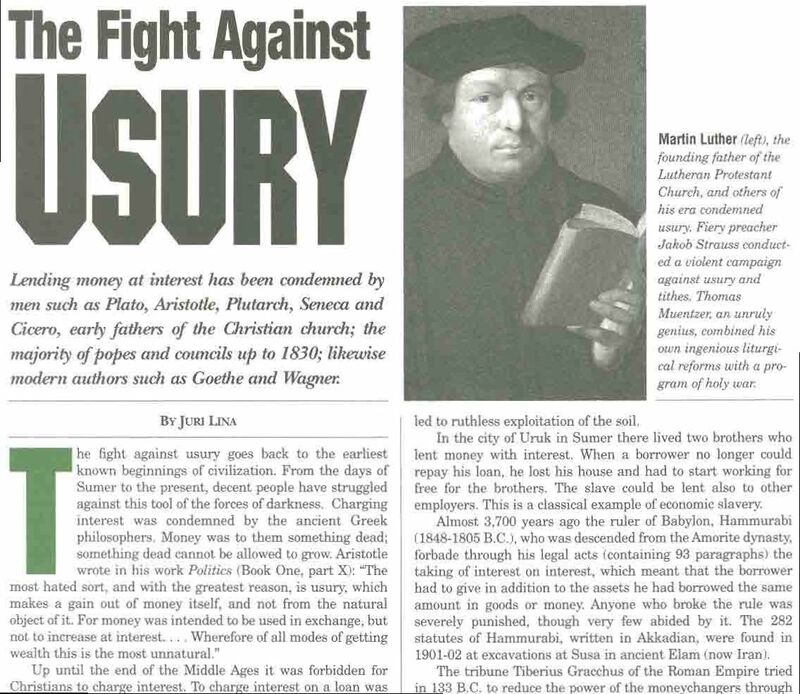 The term ‘usury’ has been avoided during the 20th Century and up to the present time in this 21st Century and up to the present time in this 21st Century. Likewise, it follows that there has been little understanding of the concepts of usuryfree living – except in those local communities where people are creating and spending their own usuryfree community currencies. What passes for orthodox economics today is a collection of economic myths, half-truths, full falsehoods, intellectual dishonesty, fraudulent reporting and wrongful thinking. Take bank loans, personal and auto, as well as mortgages, for example. Most borrowers correctly identified as debtors, believe that they are borrowing depositors'’ funds when their loan application gets approved by a duly registered and licensed bank or other financial institution. Nothing could be further from the truth. It is the signature of the debtor on the promissory note that authorizes the creditor (the bank or other financial institution) to create the principal out of thin air and hypothetize your asset. In summary, debtors are deluded into thinking that banks or credit unions are lending money, when they are really creating debt instruments. What the debtor perceives as money is really created by his/her signature on the promissory note. The majority of money in circulation is created by debt so if there is no debt, there would be no money available to negotiate trades/exchanges in this 21st Century. Furthermore, not one single bank or other institution creates the interest or usury portion of any loan or mortgage granted – thereby causing the ever-present shortage of money that politicians seek to re-distribute to solve current problems associated with poverty, scarcity and lack. Keep in mind that every creditor is granted the authority by the Bank Act to exact interest or usury from the debtor who is always subservient to the creditor. Let’s review! Through a process of constructive forgery where the banker (creditor) brings absolutely nothing to the table, a loan or mortgage is created whereby the debtor signs an IOU to the loan granting entity and the loan granting entity treats the IOU as money. Debtors create new money by a pledge of debt upon which usury is exacted until both the principal and the usury are repaid in full. 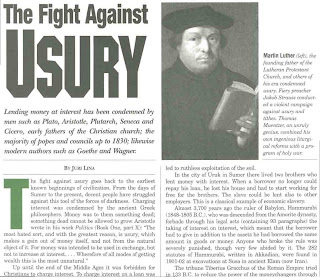 The end result is that the defenders of usury accept that orthodox finance is the accepted dogma from their Church of Usury Falsehood – a ministry similar but somewhat different from the Ministry of Truth from George Orwell’s novel 1984. In this Church of UsuryFree Falsehood the beliefs of the creditors are handed down from the Babylonian era. The reality belief that that all debtors are subservient to their creditors is blindly followed by the debtors who dare not question those beliefs on any genuine economic basis in regards to the possibility of experiencing the reality of usuryfree living. Both debtors and creditors have come to believe the incredible and impossible - that usury is a necessary function in modern age economics and that they can fulfill their usury contracts. Consider this personal example on the micro level of economics and then apply the knowledge to what is really going on in the macro level of local, national and international economics. Truly, there is a cult-like, belief system about economics taught by the high priests of economics in colleges and universities. When this intricate web of false beliefs about economics is subjected to genuine, economic research and scrutiny, it crumbles into thousands of pieces of junk economics walled in by slick marketing propaganda managed by the mainstream print and electronic media. Consider these facts and actions about usuryfree living in this 21st Century. Usuryfree creatives are actively engaged in promoting the possibility of usuryfree living by acting upon one or more of these possibilities. 1. There are currently numerous groups or networks in rural and urban communities all over the world where people are creating and spending their own usuryfree community currencies to be used as a complement with their diminishing amounts of federal cash during these transitional times. These awakening ones are commonly referred to as usuryfree creatives. 3. The growth and support for the Sixth Annual UsuryFree Day and Week (November 13th – 19th, 2010) was noteworthy and timely indeed. 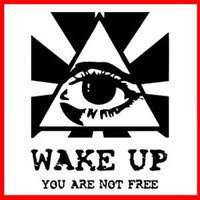 Plans are already underway to celebrate the Seventh Annual UsuryFree Day and Week (November 13th - 19th, 2011) with international events planned as more and more people awaken to the lies, deceit and deception as promoted by the Church of Usury Falsehood. 4. The booklet Life Without Usury offers a compilation of articles about money, banking, debt and usury. Additionally, there are articles about the usuryfree community currency movement and how usuryfree creatives are daring to create and spend their own usuryfree community currencies to be used as a complement with federal cash when purchasing products and/or services from local enterprises. It is available from the UsuryFree Network for a donation or gift of $20.00 plus $3.00 for postage and handling. 5. The book ‘The True Story of the Bilderberg Group’ by Daniel Estulin which was released in North America in September 2007 is providing much updated information about the historical and current activities of the Bilderbergs and their role in creating their New World Order. It is now available in most book stores – retail stores and online stores. 6. Alex Jones’ DVD titled ‘End Game’ is likewise another valuable resource for finding out what’s really going on in this world in the 21st century and what was going on in the 20th Century. Search for it at any search engine. Someday, in the not-too-distant future, usuryfree living is expected to become a reality once again as it was during the Middle Ages. Until then, we are still living in the Dark Ages of debt-based, usury finance where the power of the Church of Usury Falsehood seems absolute for those who choose to accept their lies, deceits and deceptions about money, banking and usury. Usuryfree creatives are searching for the truth and an understanding of the laws of usuryfree living. As the public is re-educated, I am hopeful that the future of our orthodox economics which relies on usury-based, debt money won'’t have a chance of long term survival. forever slaves to their greedy creditors. Without a doubt, our children’s future depends upon our taking up this challenge early in this 21st Century – with the intention of winning. I believe what Peter Jon Simpson declared in the late 1980’s – that this fight must originate as the American Revolution did 210+ years ago – in our churches. For many years, I have been sharing resources and information with clergy members from various churches as they must be re-educated first. After the eventual collapse of orthodox economics, the reality of usuryfree living will inevitably end up being experienced by all who choose to participate. If I didn’t think that the experience of usuryfree living wasn'’t a possibility, I wouldn’t have continued in this mission for the past 30+ years.